Translate Gmail email to your language by using the Gmail translate feature. If you frequently receive Gmail email in another foreign language, use this convenient feature in Gmail two translate the Gmail message to your language. Gmail is one of the mot popular email services and enables millions of people worldwide communicate with each other. Gmail is used by people of different countries and cultures and people use many different languages to communicate. Gmail supports multiple languages and so enables users to conveniently communicate in multiple languages. While people might know many different languages, they typically prefer one language and they can use Gmail to translate Gmail email to their language of choice. I you want to translate Gmail email follow the simple guide below. 1. Open the Gmail Email message. 2. In the dropdown options for the specific email, choose Translate message. 3. 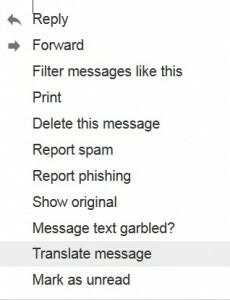 A small Translate bar will appear above the Gmail email message. Gmail will automatically detect the language it is in and suggest to translate Gmail email message into the default Gmail language you have chosen. In our example, Gmail will translate Gmail email message from Spanish to English. If you want to always have Gmail translate Spanish for you, choose Always translate Spanish. Gmail a is one f the most popular email services used by millions of people worldwide. Gmail is integrated very well with other Google services like Google plus, drive, etc. enabling users to use Gmail as a communication platform and not just a simple email service. Gmail offers great features like the ability to change Gmail default language , translate services, etc. and is a popular service that is deeply integrated into the familiar services of Google. Search is an area Google is extremely good at and Gmail is integrated with a great search feature enabling users to search and filter their emails along with the ability to label Gmail emails before sending it out.